Strawberries are a healthy and delicious fruit and when the British varieties are in season, we need little encouragement to eat as many of them as we can afford. When strawberries and cream or fruit salad begin to pall though, it's time to reach for a strawberry shortcake recipe. There is something of an American influence to this dessert, pitched midway between a sponge and a scone. This simple combination of fruit, cream and biscuity base works brilliantly, although all the ingredients have to be perfectly fresh and balanced carefully. The shortcake base is the trickiest part. Use three parts plain flour to one part butter, one part caster sugar and one part cream. The flour butter and sugar are mixed together with a dash of salt and baking powder to create a soft crumb. The cream and one egg are then blended together and gradually added to create a soft dough. To make individual shortcakes press the dough into inch thick rounds, sprinkle with caster sugar and bake for ten minutes until golden brown. 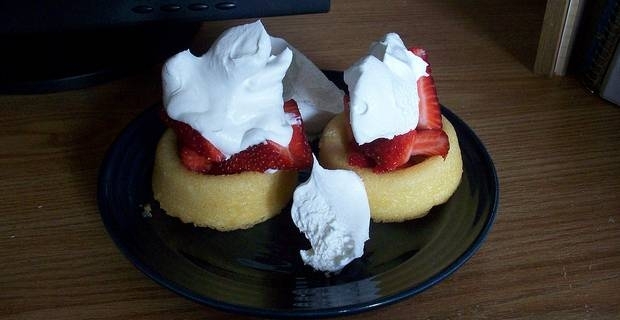 When the shortcakes have cooled, split them and pile generously with hulled and quartered strawberries and thick whipped cream. The health-conscious might opt for creme fraiche, but this is an indulgent dish so don't worry about the calories. The basic strawberry shortcake recipe can be tweaked according to taste. The strawberries can be dressed with a little lemon juice or even balsamic vinegar to add an interesting acidic touch. For the impatient, a quick variation would use ready-made petticoat tail shortbread combined with strawberries and cream. These make great sweet canapes for summer.